Mexico is currently facing the most violent year in history – with the number of homicides in 2017 being the highest it has ever been, according to the information published by the country’s Secretariado Ejecutivo del Sistema Nacional de Seguridad Pública (SESNSP). It is evident that the violence brought forth by the drug war in Mexico continues to worsen and increase the cases of homicides, abductions, extortion and robbery each year. In March of this year, Javier Salomón Aceves Gastélum, Marco García Francisco Ávalos and Jesús Daniel Díaz set out to film a school project in Guadalajara, Jalisco, Mexico. The last time the three film students were seen alive, they were being forced into a car by two men disguised as police officers. According to The Washington Post, the film students were filming their school project in a house in Tonala, Jalisco. Unbeknown to the film students, their filming ground was used as the safe house by the Nueva Plaza drug cartel. As the students were leaving the filming grounds, one of their cars broke down and they were approached by six armed men. The men forced the students into a truck and took them to a different location to be interrogated. One of the students was tortured so brutally that he was killed during the interrogation; the two other students were killed after the interrogation. The students were tortured, murdered, and their bodies dissolved in acid. The disappearance of the film students caused lots of outrage among their community. 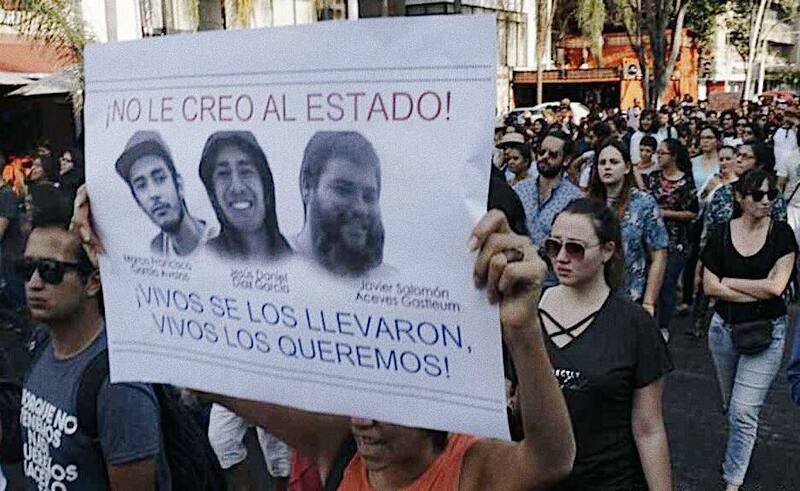 Thousands of college students gathered among the streets of Guadalajara and Mexico City – some of the biggest cities in the country – to march, express their anger over the situation, and demand justice not only for the three film students but the thousands of others who have gone missing in Mexico. During the march, the students held up posters which read “#NoSonTresSomosTodxs” meaning “It’s not three, it’s all of us.” Additionally, the students chanted: “We’re students, not criminals. Will I be next?” Other protesters were seen holding up signs saying “Nos Estan Matando” (“They Are Killing Us”) and “Nos Estan Desapareciendo” (“They Are Making Us Disappear”). This tragedy has sparked outrage regarding the Mexican government’s lack of response to the disappearance of Mexico’s youth. According to the U.S. News website, by the end of 2016, the drug war in Mexico had led to the disappearance of 30,000 people. The numbers continue to increase every year, indicating a serious problem that is not being handled as it should be. Juan Martinez Perez, the director of a non-governmental organization known as Rights to Childhood, said “the disappearance of children, teen and young adults is attributable to factors including organized crime, lack of protection by the government, corruption and authorities’ complicity with criminal groups in many places,” according to The New York Times. From a young age, families teach their kids the importance of staying in school and keeping out of trouble, but so many people tragically lose their lives simply for being at the wrong place, at the wrong time. Javier Salomón Aceves Gastélum, Marco García Francisco Ávalos and Jesús Daniel Díaz should not have had to fear for their life while simply working on a film project for school. College students should not have to plead with the government to find their missing classmates and bring them home alive. Young people should not have to walk the streets of Mexico fearing that they can become another missing person at any given moment. Melgoza believes that “today more than ever we must demand to live in a society where people with dreams and aspirations can reach for their goals without fearing that violence and organized crime will kill them off.” Melgoza sends his condolences to the families of the brilliant and talented film students; he believes their names were part of the future of Mexico. There is an undeniable problem with organized crime and lack of interest on behalf of the Mexican government. Now more than ever, it is important for us to come together and demand change. We, as people of Mexican descent and activists, must hold the Mexican government accountable and urge them to get involved in the repercussions brought forth by the drug war and put a stop to the increasing number of disappearances in Mexico.